This fly-or-be-trapped educational toy is apparently irresistible to elementary school children. Slide your hand into the back and when a bug gets close, snap it shut! 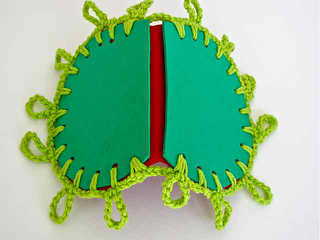 Pattern includes instructions for flies too). The loops around the edge can be interlocked to zip it closed for complete fly digestion (see 3rd photo). This step seems to fascinate some children. The Venus Flytrapper was originally designed as a donation to a holiday event at my son’s elementary school called “Mini-Mall,” where students could spend the classroom “dollars” they earned. My third grader and I underestimated the appeal of these Venus Flytraps and they sold out quickly. A bidding war broke out over the last one! Pattern is for local use only; if you would like to make these for an elementary school in your area, please email me for a few simple particulars. Skill Level: Beginner. Pattern has been written with no abbreviations for new pattern readers. This project was originally designed for parent and child to make together. My son cut out the shapes and I crocheted them together, however, a child who has learned the basics of crocheting could do every step. 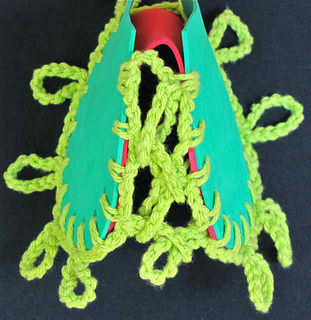 How to crochet around the edge of craft foam or other material. 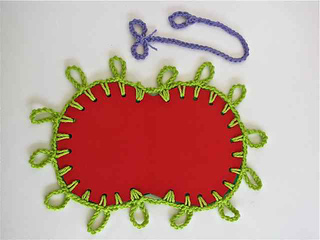 How to use simple crochet stitches for a zipper “fly trap”. Crochet Hook: size G/7/4.5mm was used; use a size that comfortably pulls yarn through the punched holes of the foam shapes. Yarns used for pictured project: Lily’s Sugar ‘n Cream (100% Cotton, 120yds/109m per 2.5oz/71g ball), color #01712 Hot Green; plus a few yards/meters of any yarn for flies. Substituting other yarns: Any worsted weight (category #4 Medium weight) yarn in any size ball can be used. Close substitutes would be Pisgah’s Peaches & Crème (100% Cotton, Color 351 Apple Green; or Coats & Clark’s Crème de la Crème (100% Combed Cotton, Color #0625 Brite Green. 1 red foam sheet and 1 green foam sheet, each at least 6 X 9 inches/ cm, any brand. Used for pictured project: Creative Hands Foam Sheets by Fibre-Craft Materials Corp. (UPC 0-2844457641-7). Paper hole puncher that punches holes with a 3/16th or 1/4th-inch (5-6mm) diameter.